It’s a shame that certain genres are best summed up by comparisons to other bands. 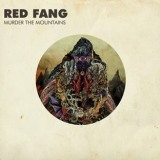 Red Fang have a great sound, honed songwriting skills and the instrumental chops to perform, but they haven’t got an original breath in their body, which makes describing Murder The Mountains difficult. It’s what you’d get if you threw Queens Of The Stone Age, Black Sabbath and Melvins into a blender and made a lumpy smoothie, bits of each floating to the top during certain songs. All, however, are blissful, catchy yet heavy stompin’ killer tunes, perfect for a soundtrack to the oncoming summer. Some will already know the band for their amusing music video to Prehistoric Dog, from their first album, a sense of humour enough to get the band the publicity they need to succeed in these modern times. Sadly, I doubt the music video for Wires from this album will be enough to repeat the trick, although both song and video are better. You have to watch them, really, because they sum the band up well, and that sense of humour and love of riffs is what makes Murder The Mountains as much fun as it is. Each second has a smile attached. The paranoid meanderings of opener Malverde with the repeated chorus line ‘that’s a trick!’ is all too happy to lose itself in guitar melodies, the mildly rough vocals of that song turning to more stoner-ified singing as the atmosphere works its calming magic. The aforementioned Wires is a wonderful crossover point between classic and post-Kyuss schools of doom, stealing the former’s singing and latter’s desert wind to form a rather compelling whole. Distant backing organs only add to the gloriousness, a mid-track slow-down to ponderous snail’s pace sure to urge cheers from old-schoolers, and the pumped-up shouty stomp of Dirt Wizard speaks to the rocker in us all. Infectious and irresistible is the bassy rumble of Throw Up, building up with urgent, siren-like riffs to a climatic peak and pure noise – this kind of experimental sound is what I’d like the band to build on next. Still, for the moment, the likes of Painted Parade are a great place for Red Fang to reside, stomp-along good-timers with cheerful life aplenty. If you have Foo Fighters-loving friends and are in search of that catchy yet heavy band to bring them aboard the good ship metal, this is a good port of call. Second-half gems like Into The Eye verge on psychedelia, built on in the following The Undertow which is out-and-out flaming Hawkwind worship at moments. By the time the album’s brought to a close with the dulcet rockin’ tones of Human Herd, you’ll be rightfully in love with this band, whether newcomer to the stoner zone or firm veteran.